You’d think by now we’d all be used to the waiting, and have a little bit more patience when dealing with the endless rounds of hurry up and wait. Not. It’s not that simple. Because the longer we had to wait for the testing, the more his shortness of breath slowly worsened, the more tired he got each day, and despite an afternoon nap after work to be able to function for a while during the evening, the harder and more frustrating his situation became. Walking up the stairs to get ready for bed even became an effort. The morning he went out to get the newspaper and was out of breath from walking up the four steps back to our front door…well, we knew something had to happen, and soon! After the cath and the other two tests, we were able to schedule the X-rays of his mouth and jaw for the following week. That was simple. And the nuclear CT scan was set for the following Wednesday. Could we possibly get his surgery done before our granddaughter was born? It was starting to look like it just could happen! Because the Friday before the scheduled Wednesday procedure, the hospital called him and said they were canceling it! Why? Because his insurance company hadn’t approved it yet! When he called me to let me know, he was so upset and so angry I was afraid he was going to have a stroke! Calls to his insurance company and back and forth to the hospital were only somewhat successful. The hospital agreed to not cancel his slot until the morning of the procedure in case it was approved at the last minute. 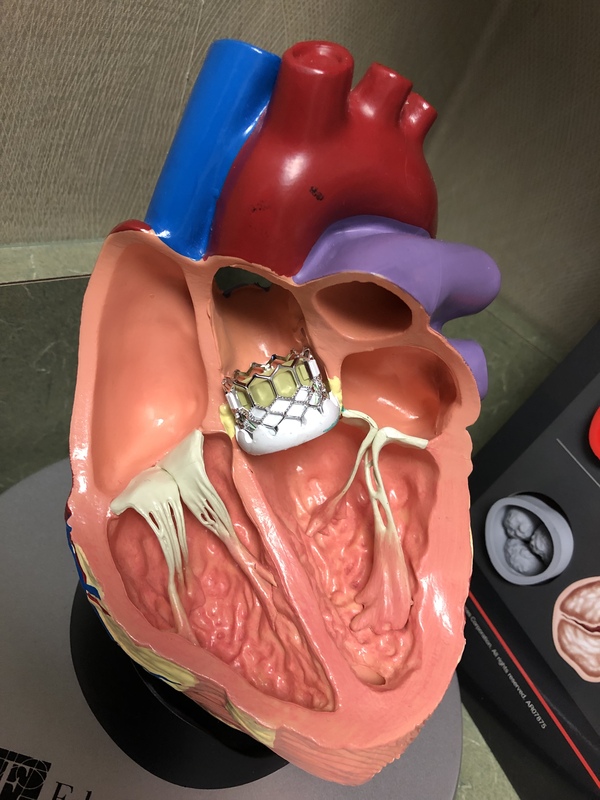 And the representative from the insurance company, after Ben had explained the reason for the CT scan as well as its importance for approval of the TAVR procedure for his heart valve replacement, agreed to do everything she could to speed up the approval process. And once again we were in a holding pattern, waiting for answers. And wondering how long this delay would set us back. But, not unexpectedly, at 11:00 that morning he got the call that he was being rescheduled for the following week because the approval hadn’t come through. Again we had to wait! And it was a long wait. We wondered if the insurance company would come through or not. Now for just a moment, imagine how it feels to know that your health, your very future, depends on people you don’t know, will never meet, and who know nothing about you at all except what they see on paper and compare your situation to their handbook of whether or not your case qualifies per their standards of payment approval. And you can’t help but wonder if they’ll try to find a loophole to deny testing. Yes, it does come down many times to the insurance company, but that’s why we have health insurance. We cannot afford all of this on our own; very few people could. We imagined a group of people sitting around in a room trying to find a way they could say no to avoid paying for the procedure. Yes, your mind goes there. And in this case, so would yours. But finally, the beginning of the next week, we got a call that the test was approved! Now we could hopefully get this resolved and move on to setting a surgery date. So Thursday afternoon he headed to the hospital for the CT scan, which would hopefully lead to his valve being replaced and both of us getting our lives back together. This CT scan was the easiest test he had in the process. It was done quickly, was non-invasive, and with no side effects whatsoever. After the test we met with a Physician’s Assistant who briefly went over the test results to date, which she said appeared to indicate the TAVR procedure would work in his case, however, that couldn’t be absolutely determined until all of the testing was evaluated together, including the CT scan he’d just had. 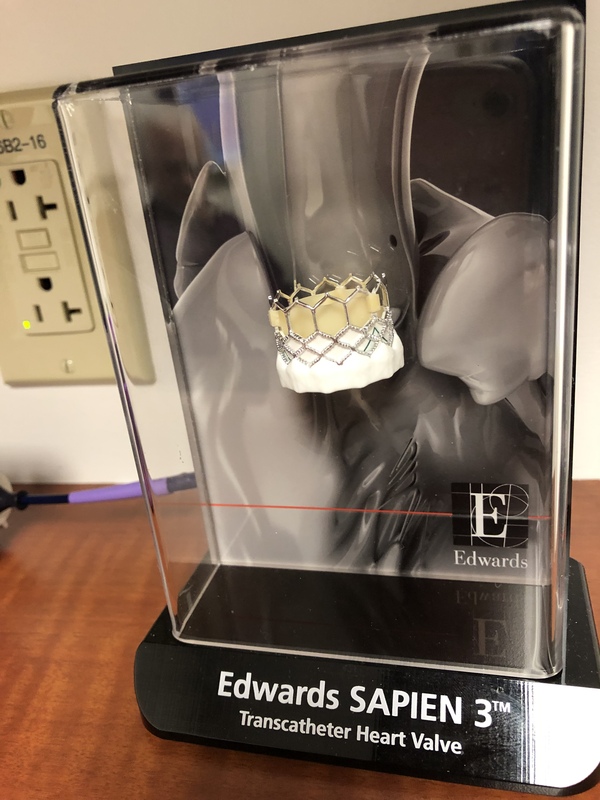 We did, however, get to take a look at the models of the two types of heart valves that would be considered if this type of surgery was used. 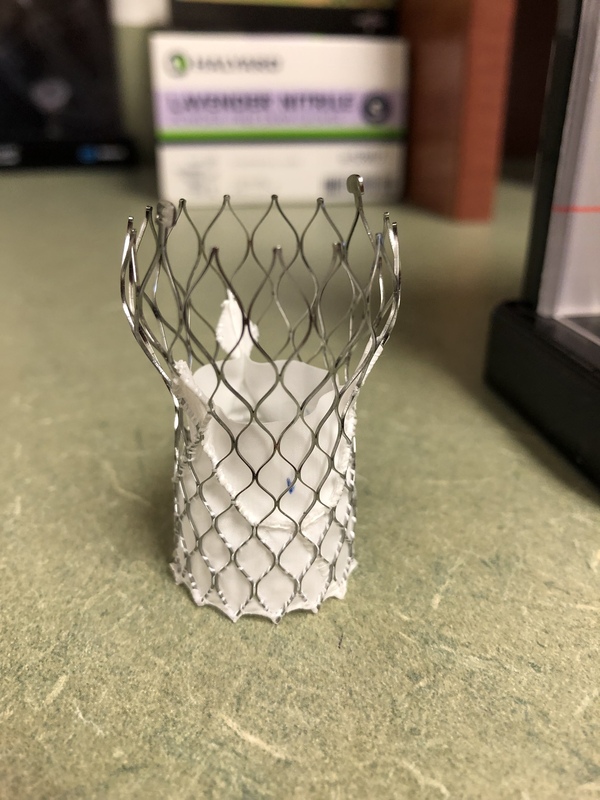 I was a bit surprised at how big they were, but the PA explained that they were crimped smaller when placed on the end of the catheter, and then expanded when they were properly placed in the heart. That would also be explained in detail when we met with all the doctors involved to discuss the surgical plan. So we were hopeful. Things were finally moving along. Next step…the big consultation, which was scheduled for 10 days later, possibly lasting up to three hours! Not much longer to wait. And then we’d finally have the surgery date. The story continues in Matters of the Heart, Part 15, to be published April 22.